Running With Our Eyes Closed is the story of Dallas socialite, Samantha, and her husband Michael. With three children living on their own, she's prepared to leave her life behind. Michael has secrets and his own agenda that may change their lives forever. Nothing is quite what they'd imagined it to be. Over seven days in Italy, they attempt to define their new roles as a couple and as individuals. Mel Greenberg is the married mother of two sons in their early twenties. She worked as a copywriter and producer in radio and television before having children and making the decision to stay at home with them full-time. Four years ago she became an empty nester, and she struggled to find her voice and direction. 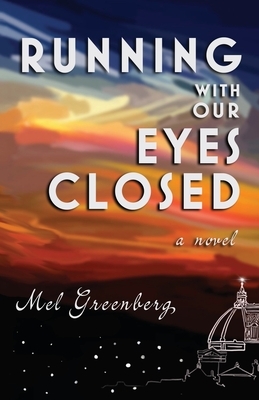 Ultimately, it was her passion for writing and the discovery that she was not alone that led her to write “Running With Our Eyes Closed.” It is the first installment of a series exploring her characters’ struggle to redefine their lives as empty nesters. When she's not visiting her boys, and traveling the world, Mel enjoys life in the Southwest with her husband Dean, her beloved English Bulldog Bruno, and German Shepherd Grazia.